Without the financial support of our many donors we would be unable to continue making such a difference to so many communities. By making a donation to IVDT you become a partner in our work, and we are very grateful for that help. 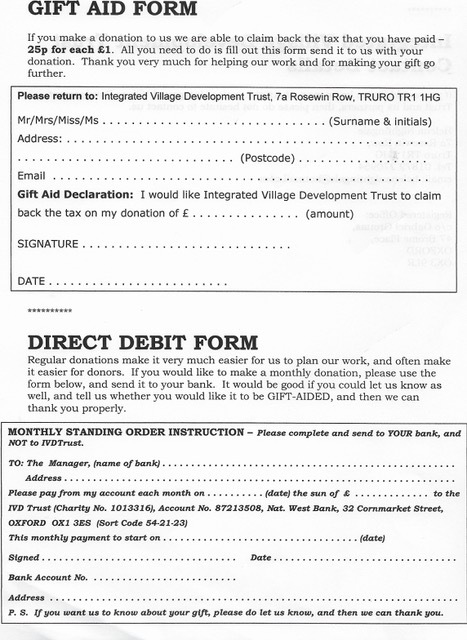 If you make a donation to us we are able to claim back the tax that you have paid – 25p for each £1! All you need to do is fill out the form below and send it to us with your donation. It is also possible to make a payment by transfer (Bank details: NatWest Bank, Sort code: 54-21-23; A/c No 87213508; A/c Name: IVD (UK) Trust). Regular donations make it easier for us to work, and often make it easier for donors. If you would like to make a monthly donation please use the form below and send it to your bank. It would be wonderful if you could let us know as well and to tell us whether you would like your regular donations Gift-Aided. We could also then thank you properly.